This is state-of-the art stereo audio system, designed for working with digital source – digital transport, music streemer or multimedia center; DSP controled; 12 speaker drivers powered by 12 class D amplifiers; fully active – without passive components trough signal path; Wi-fi, Bluetooth and USB connectivity, coaxial and optical digital inputs and line-in analogue input; full remote control and ability to play directly from a smartphone or a tablet. This audio system is a dream which came true. It took some time from the initial sketches to the realization of the project. This is my first project in which I materialize an idea in so complex way – visual design combined with electronics, methods of workmanship, choice of materials and complete fitting all elements together. I needed help during the manufacture, the painting and the varnishing of the wooden details, but in general this is a single-minded, one-man project. These lines are more visual presentation of the system, because it is difficult for me to represent the system in other way just by writing. Control knob, all indicators and DSP-module are located in the central component. The three modulеs of electronics share a common vision. My idea was to use simplified lines to create good-looking proportions and design details in a simple form. Тhe dimensions arе 450 х 450 mm unto height only 58 mm. 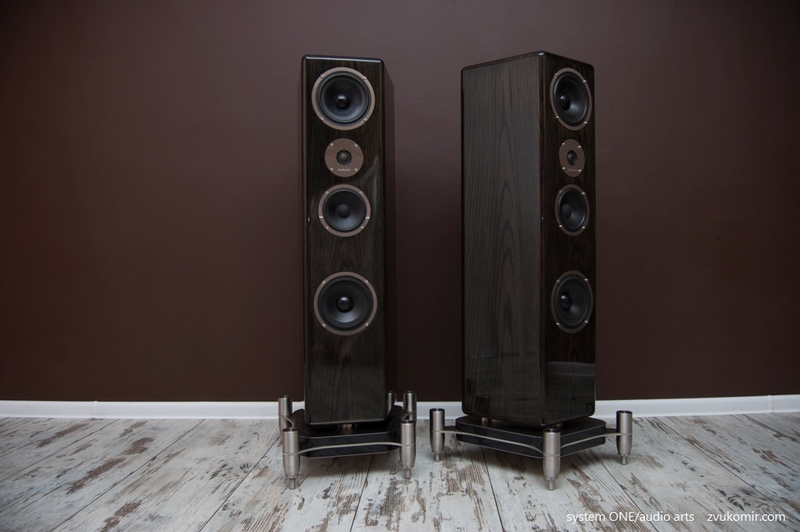 The chassis is made of the high-quality birch plywood in (not just) black and has a semi-gloss finish. The top and the bottom plates are made of brushed stainless steel with white engraved inscriptions. The construction is antiresonance and three-legged. Because of its deep texture the steel varies with several color shades depending on the different viewing angle and the surrounding lighting. Sometimes the upper plates may look uniformly gray and sometimes the “brush” effect is enhanced when the white inscriptions become black. Only one minimalist knob is responsible for operating with the system. 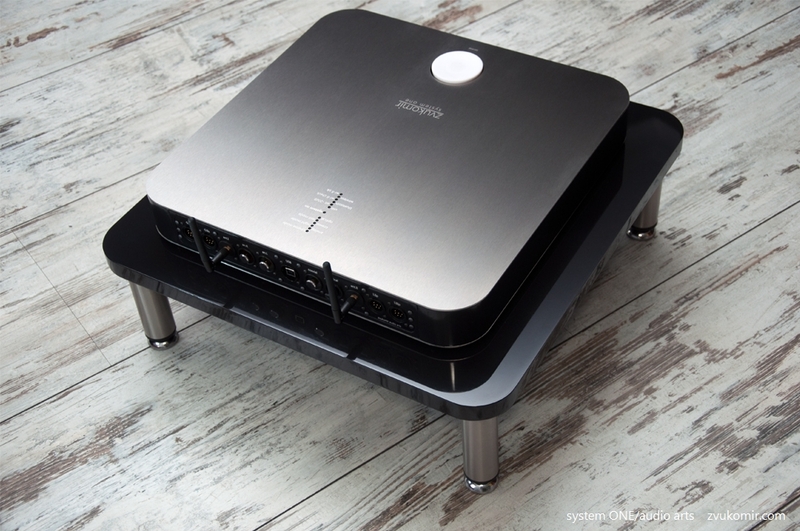 It executes a variety of functions, the main of which is to control the volume. It is made by a 3D printer. The material which is used for the knob is biodegradable corn starch and thanks to certain treatments the touching of the button is very nice. To correspond with the white inscriptions the knob is also in white color. Its form is more complex than the visible form over the box, which provides balance in rotation. Its size is about 40 cc. I spent a lot of attention with its design, because the knob occupies a central place in the visual concept and it is the element of direct interaction with System One. Located up (as an acquaintance subsequently drew a parallel with the classic Japanese exclusive audio equipment) LED lights indicate the various inputs and modes. All LED lights have a narrow angle of luminance which is sufficiently visible and non obtrusive. The lights are white, except that light showing the work of Bluetooth, which is blue. In the central front of the control unit, just below the knob is located the single element in the completely simplified front lines of the three boxes. This is the window of the IR receiver for the remote control. I wanted it to be wider with a view to expand the range of commands. The angle is large, which makes possible the management of the system from many positions in the room. Because of the protective glass is not possible to see the electronics inside. 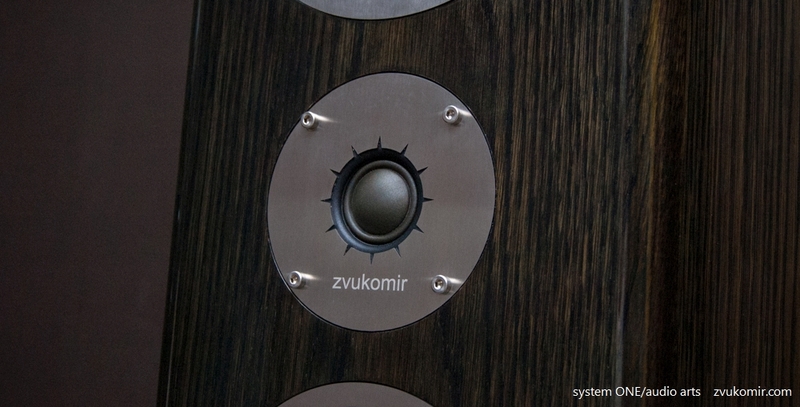 The glass also protects the delicate inscription of chrome-nickel steel “zvukomir”. The idea – the inscription to be lighted, occurred to me at the stage of drawing, but the final version has no lighting. The well polished inscription has highly reflective features and interacts with the light in the room in a specific way. The picture above exactly shows reflected light, seen through the color of the tinted glass. The effect occurs when a person walks around the room or sits on the central listening position and looks at the boxes – the inscription can shine for a moment and hide again. A discrete and interesting vision, corresponding to the conception. The rear panel of the control unit is the connection of the system with the signal sources. 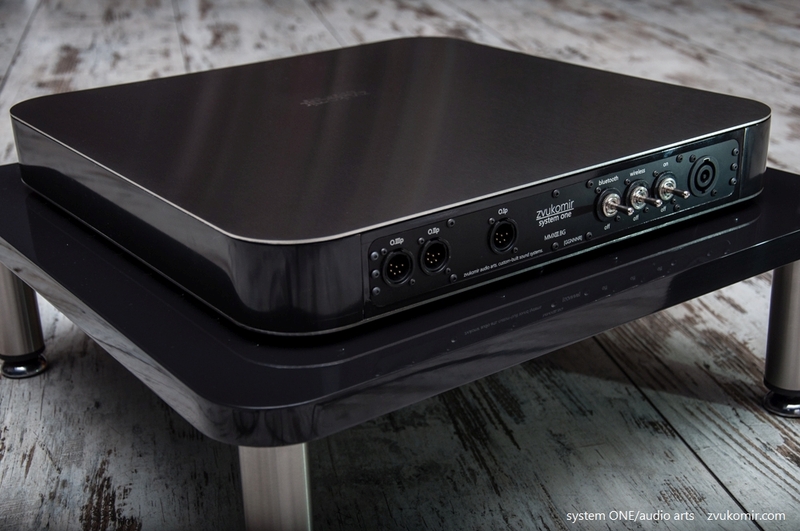 Available are: Line-In(AUX) analogue input (for FM-tuner or turntable with external RIAA, TOSLINK, RCA Digital coaxial, USB type B, and pair of antenas. Wi-Fi connection in its current realization does not meet my requirements for quality reproduction, but i am constantly wide awake for searching and experimentation with new solutions. 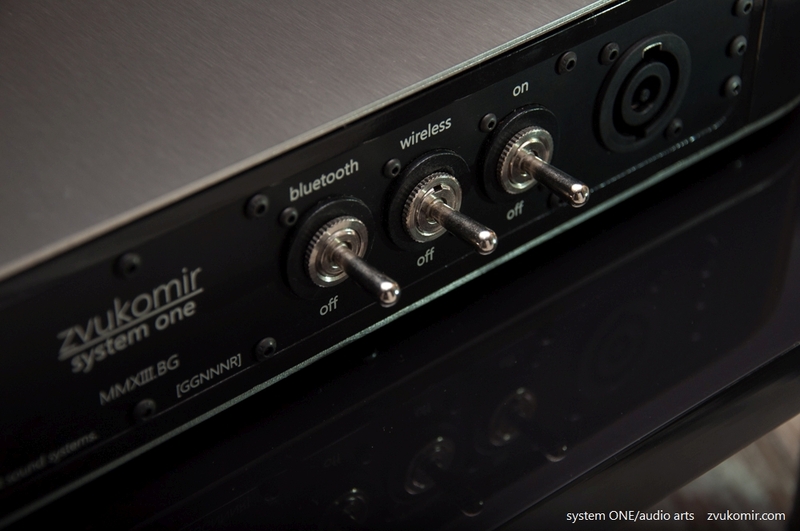 The Bluetooth module is a quick and easy way to share the moment of listening by playing music directly from the phone. This rhoduim caps shield all RCA connectors. This box contains twelve power amplifiers. Specific wiring, mechanical anti-vibration control and without other electronics for the most “pure” signal. The last represented third box is actually the first on the total picture – it enlivens the whole system. On the back panel are placed three rocker switches. They are metal, with a nice switch and classic ‘click’ as a reference cassette deck. Through these details I had a great desire to make the connection between the vintage workmanship and the modern vision. 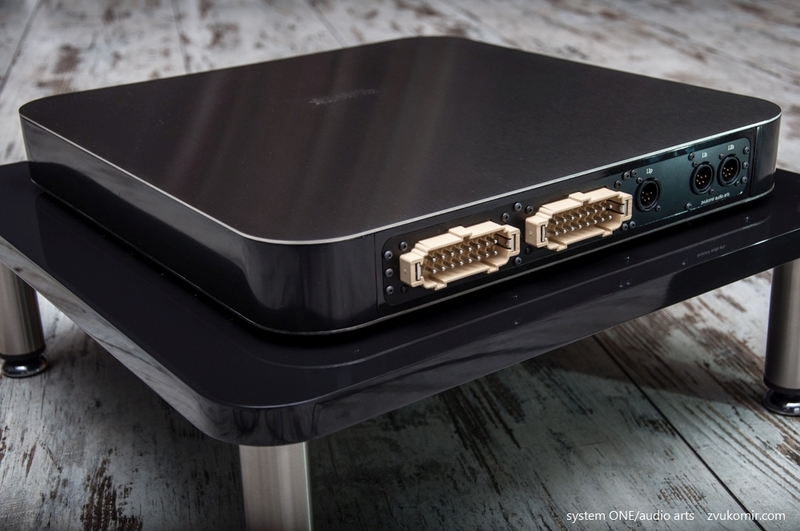 The switches turn on and off the whole system and the power of wireless devices, so the antennas will not work when they are not needed. Below they are shooted how they look in different positions. As a first project, according to my experience and knowledge at that point, I decided that I will use good factory speakers as a base on which to build my ideas. I had an idea what I’m looking for and I got a high-end German speakers. I listened to them about half a year – first in the original condition, then in a slightly modified condition, and then – in full active mode, with one of the early prototypes of electronics. My goal was to assess their options and to decide whether to use them in the future system. 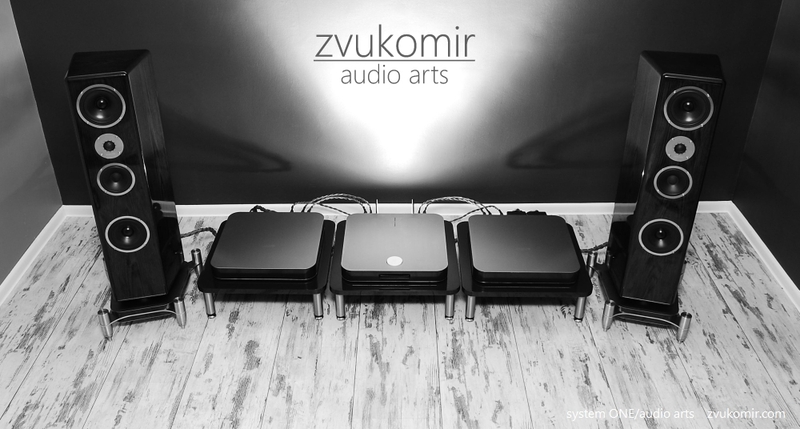 The bodies of the speakers have very interesting design solutions as a box in the box, asymmetrical walls against standing waves. 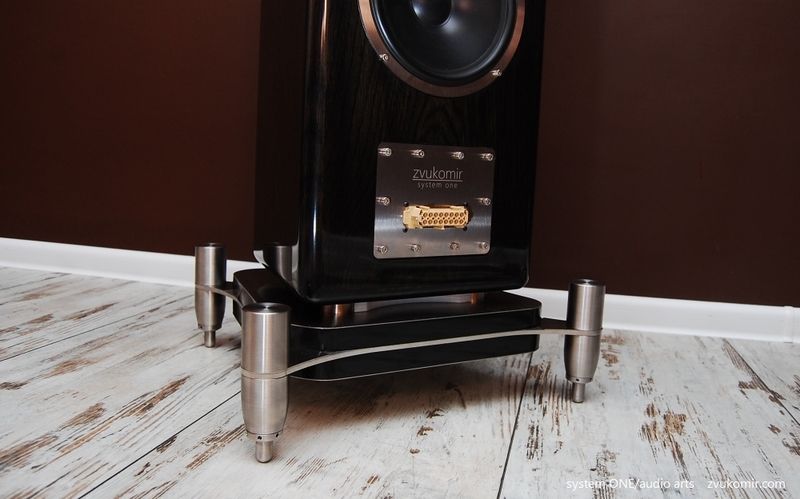 The speakers are mirror-symmetrical to each other and have rounded corners. 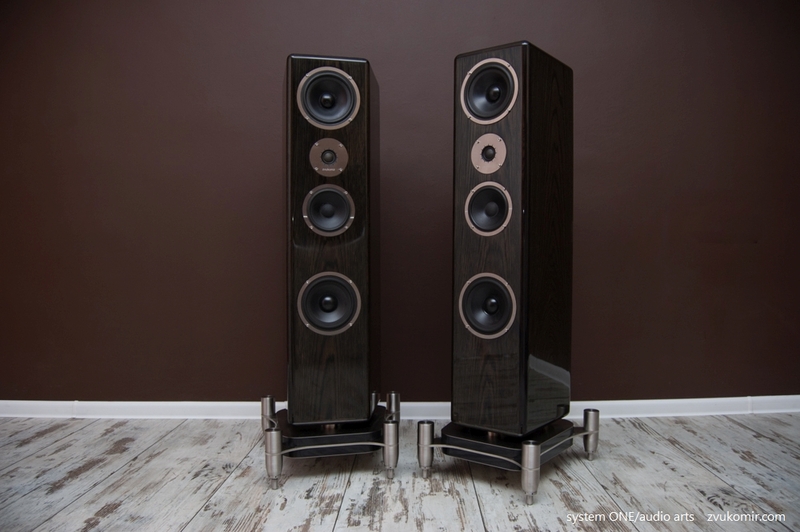 Their unique construction and the changes that they have experienced, allowed me to explore many aspects of this complex electro-mechanical-acoustic system called “speaker”. It is interesting that the only “random” element in the whole system is its color. 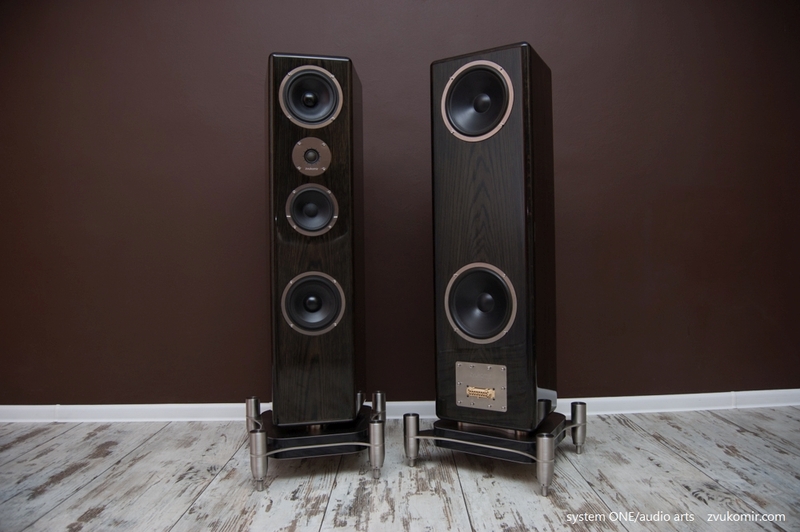 The color can not be repeated, there was only one bottle оf dye and it was enough for both speakers. The result: lovely rich colour with many shades and gradations. It is hard the colour to reveal its beauty in room lighting. It is amazing in direct sunlight. Homemade photos do not show almost nothing of its complexity and dynamics. The next picture shows the slight green shades and the bright inclusions, contrasting under several layers of piano lacquer. The vision is completed by the steel bracelets of the drivers. The bracelets are caught with stainless steel screws. The Bracelet of the tweeter speaker is slotted. That is inspired by my observations and listening to other similar speakers by Roksan, PMC, early Audio-Physic. That is also an interesting field for experiments. The geometry on the picture is the third final try for now. I did many 3D models during the design of the stands and I chose this a little bit larger form with slightly changed corners, which follows the line of the speakers. The stable legs are attached to the base plate, whose proportions are built according to certain ratios in the system. 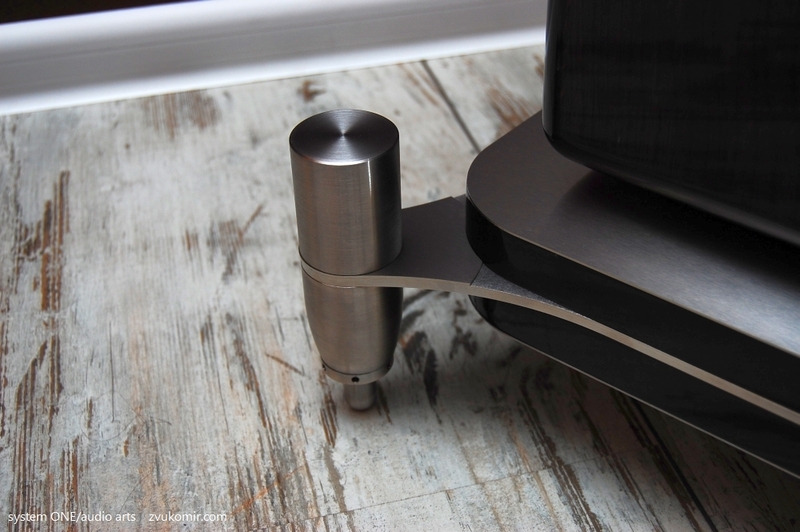 The legs are quite harmonious with the speakers, look well and even somewhat dynamically. The height is not accidental and has to do with the positioning of the speakers. 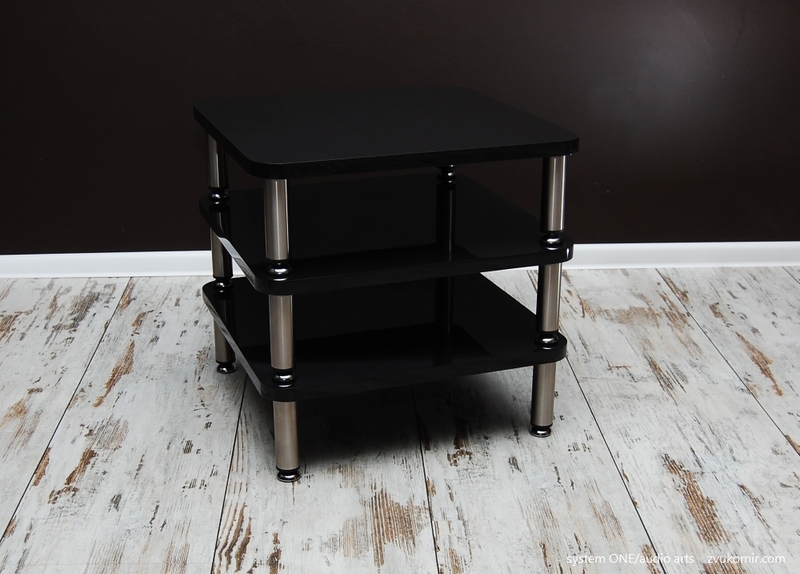 Again the stands are made of solid birch plywood and stainless steel. The stands follow the colour of the boxes and the tables. 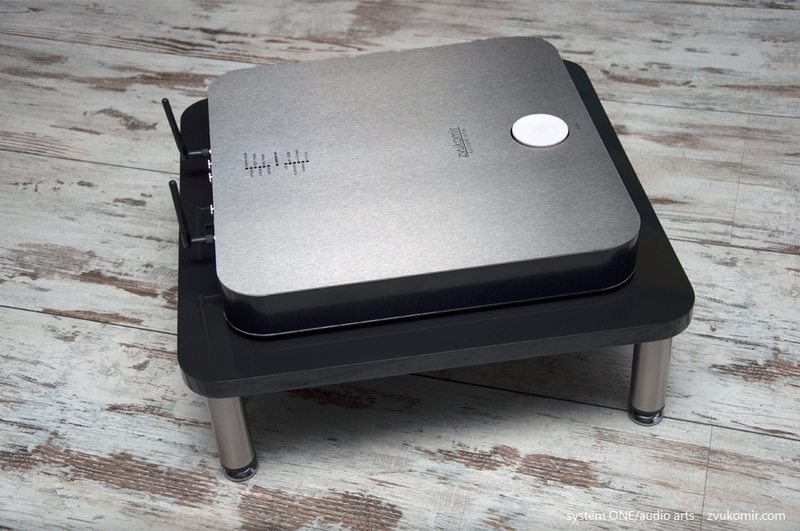 The weight of the stand is as the weight of a normal modern standing speaker. The legs are made of stainless steel rod. The specific oblique shape is achieved with a digitally controlled lathe and the final appearance – with several mechanical treatments. The legs have four components. They are able to be adjusted accurately and allow optimum adjustment. Their contact part ends with a sphere – that was my initial idea. Each leg weighs about 2 kilograms, which is actually quite, based on how usually a typical floorstander’s leg weighs. The shape of the tables follows the boxes of electronics. The proportions and the dimensions of the tables allow compact layout of the boxes one above the other, if there is no enough space in the room for horizontally arranged system. The tables are made of birch plywood and steel legs with pads which insulate the vibrations. I paid a lot of attention of the wiring even during the design of the wiring. In fact, the idea of the wiring and its practical implementation are a separate system in the system, so I call the wiring – a cable system. From the beginning, I began to experiment with the cables. 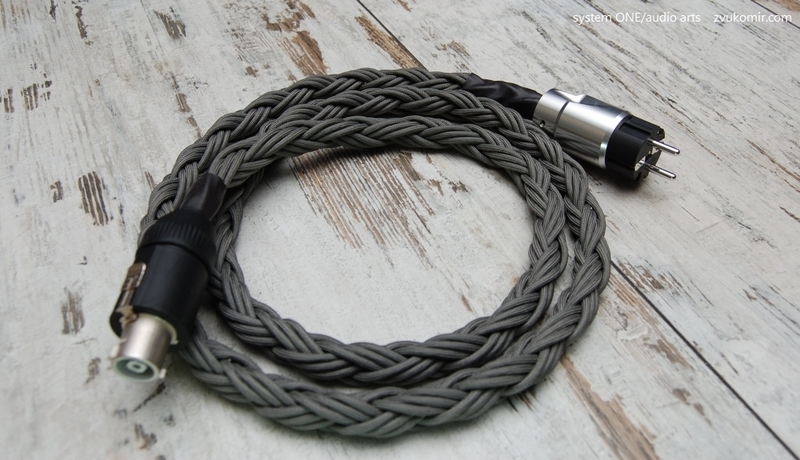 I gradually started to choose the right cable for each loop and to determine the specific requirements of the cables. I had the opportunity to hear a lot of cables. And although this is a vast field of research, the result of this work is good. On his way the cable meets only one different kind of metal, twice – that of the connector. This minimalist conception of a directed cable and one type contact metal attends almost everywhere (signals low, high level, etc.). 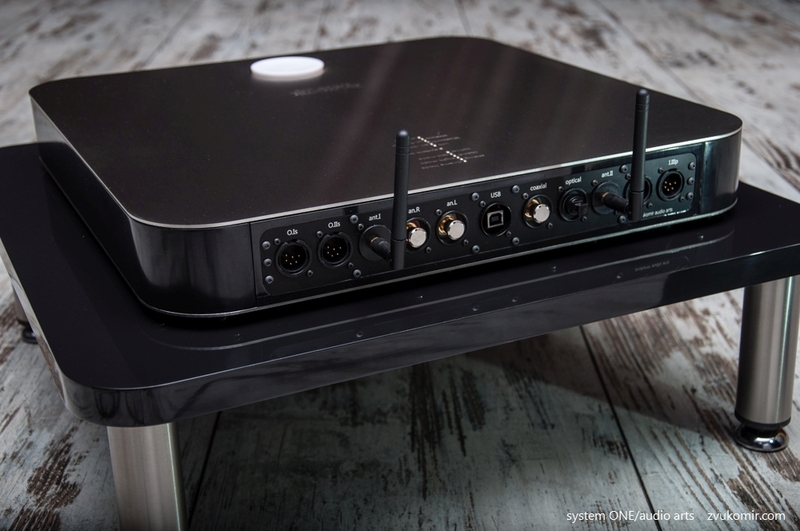 You can try to imagine across how many different types of cables, metals on terminals and connectors and components on the filter passes the signal at a classically organized audio system. 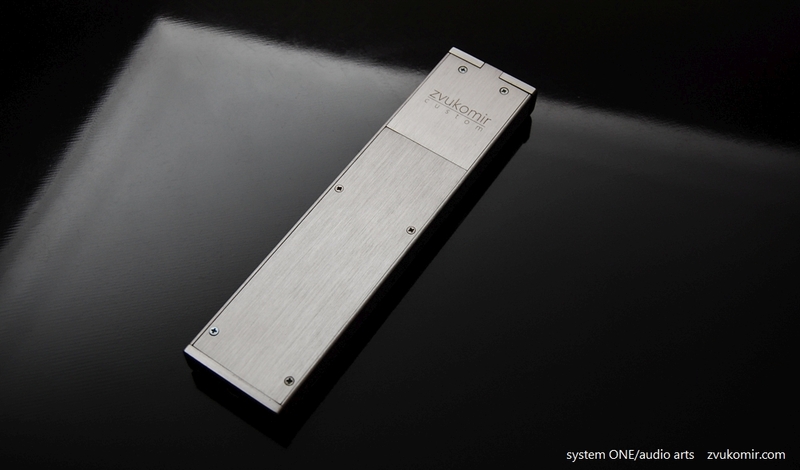 System One is designed at first on a white sheet and even on the sheet i saw it as a conceptual whole. To design on the sheet was very useful and I was able to materialize this so simple idea, despite of how hard was this. The mains cable is fitted with a powerCON 32A on one side and a solid alluminium EU Scuko on other side. The mains cable is a solid, machined, aluminum body, type Schuko from one side and a top model powerCON of Neutrik, lockable, 32 Ampere connector on the side of the power box. 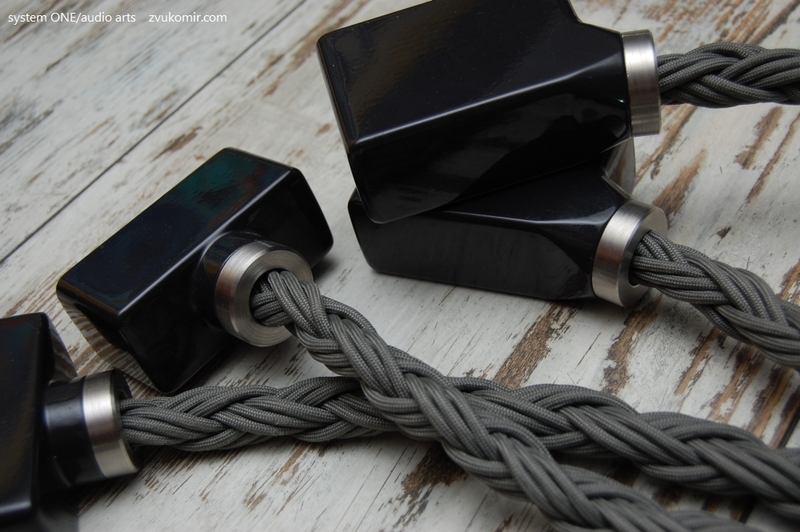 The connectors of the speakers’ cables are processed, polished and painted in the same black color as the boxes, the tables and the stands. For ending emphasis i added rings made of brushed stainless steel. The layout of the interconnects is elegant and follows the natural path of the signal. The layout is organized so that behind the system there are no intersecting wires, and these cables which form semi-circles are equidistant from one another. 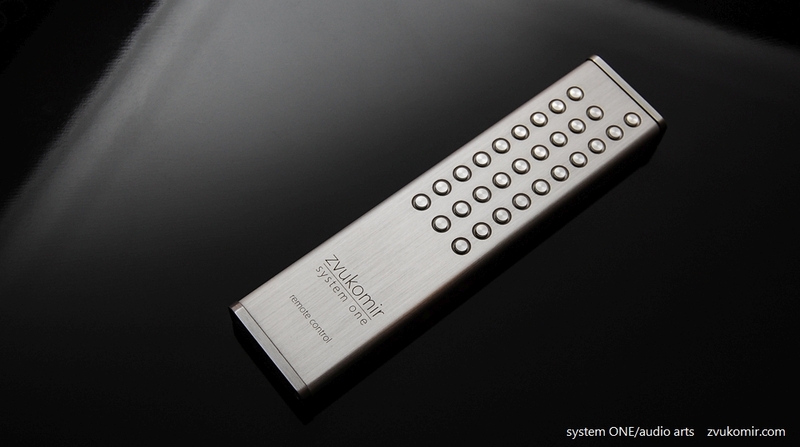 The remote is the connection with the system most of the time, so the feel from it, the weight and the coolness of the metal are also important. 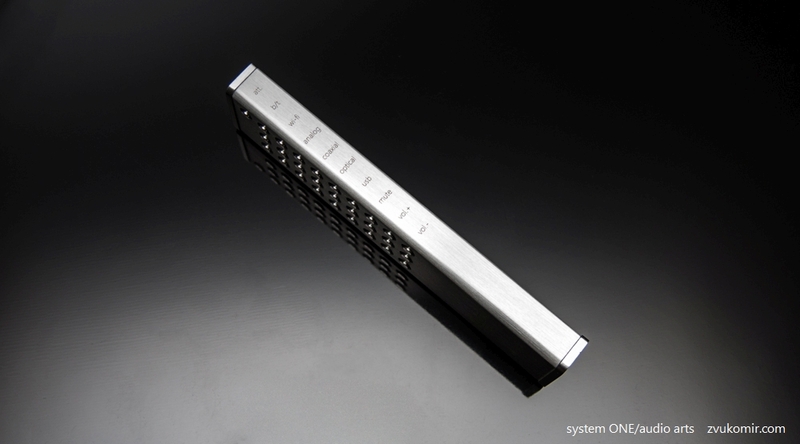 For this system I recasted a manufacturing panel – all-aluminum, with aluminum buttons and weighing 220 grams. The engraving is white, but changes its color according to the available light and angle. The inscriptions on the buttons are sidewards – it was easier for lettering. Тhis is unusual, but actually quite convenient solution.